This set honey is wholesome, sweet and naturally tasty. Ideal for spreading on crusty bread or toast. Suitable for vegetarians. 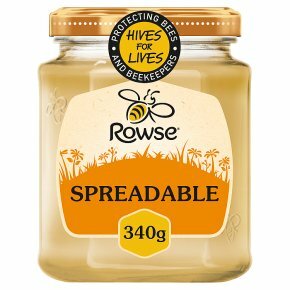 Kosher - KLBD.Rowse breakfast honeys are 100% Pure and Natural - just like nature intended: with nothing added and none of the natural goodness taken away. They are perfect for waking up your breakfast, naturally and come in glass jars and squeezy bottles, as well as set and clear varieties. Rowse Set Honey has been gently churned and chilled to give a velvety, silky-smooth, set consistency and a creamy colour. It is well rounded, velvety, rich and has a naturally occurring buttery flavour with distinct fruity back notes. Brilliant for breakfast! Spread onto toast, fresh crusty bread, crumpets, bagels or muffins.